Reading a haphazardly constructed novel really teaches you something about the skill that goes into the creation of a good novel. When you read a novel like Grapes of Wrath or Anna Karenina, you don’t wonder, “Hey…why is there this monologue from the point of view of a car salesman” or “Why are we suddenly watching an opera?” You just keep reading. You trust the author to maintain some level of thematic coherence. 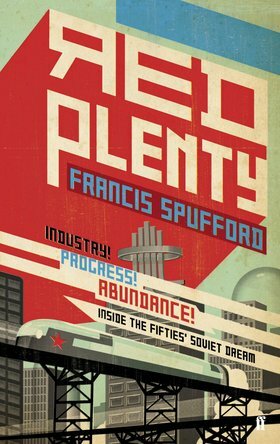 About halfway through reading Red Plenty, I realized that I did not trust its author. The book is ostensibly about an effort by a team of Soviet economists to introduce optimal pricing into the system (and, hence, gain efficiency improvements that would eventually allow the Soviet Union to outpace capitalist economies). But why was there a chapter that was told from the point of view of a renowned playwright who has started to become uncomfortable with the censorship regime? Why are there all these chapters from the point of view of Nikita Khruschev? Why is there a chapter where a woman who is in labor bullies a nurse into providing her with painkillers? Why are there all these colorful bits that are meant to illustrate how the Soviet economy really works? By about halfway through the novel, I realized that it only really works if you consider its through-line plot to be just a single strand in an overarching tapestry of 1960s economic life in Soviet Russia–a period of time when the country enjoyed considerable prosperity and optimism and relative freedom, compared to what came immediately before and after. But Red Plenty also illustrates how important it is to choose your subject matter correctly. The book was one of the most fascinating and enjoyable books that I’ve read this year. Most novels that are about totalitarian regimes tend to dumb down and universalize their facets. They focus on the gun and the gulag and the jackboot. And that’s fine. But the Soviet Union was also one of the most bizarre and artificial societies in the world. It was a country that was literally ruled by bureaucrats–an economy based around subsistence agriculture that, within fifty years, was able to shoot men into space. Something was going on there. It wasn’t just the gun and the jackboot. It was also a place where four generations of people were born and died. And it was a place that, at least during the 60s, was home to plenty of brilliant and optimistic people who really believed that their country was at the vanguard of human progress. It’s fascinating to see how it all worked in practice. The book, too, is an interesting blend of fiction and nonfiction. Many of the characters are historical figures, and each chapter is accompanied by foot-notes that detail exactly which parts are fictional and which parts are real (and cite sources for many of the details within the text). The book is so specific and interesting and weird that it’s hard to believe it actually exists. Red Plenty feels more like the object of some kind of Borgesian errata (“Tlon, Urqon, Orbius Tertius” or “The Approach To Al-Mu’tasim”) than it does like an actual book which was written by an actual author and printed by an actual publisher.